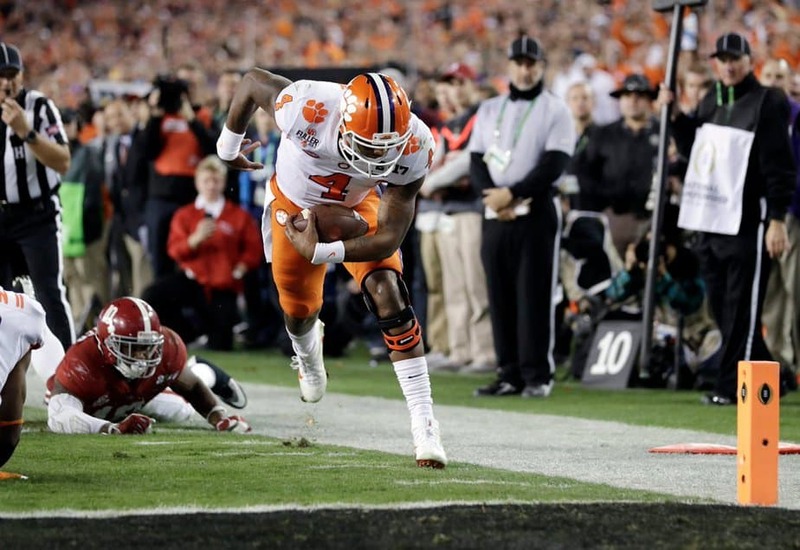 CFP National Championship Game Recap: Clemson Takes Down Alabama With Last Second Touchdown! When the CFP system was devised, the hope was that a true national champion could be crowned after the two best teams in the nation battled it out on the gridiron. After watching how quickly Clemson dispatched Ohio State and how Alabama defeated Washington, it was clear who the best two teams in the nation were. After watching Clemson and Alabama play Monday night, it became clear who the best team in the nation is–the Clemson Tigers! Clemson didn’t take its first lead of the game until late in the fourth quarter when Wayne Gallman took the ball over the goal line from a yard out. However, with 4:38 to go, there was more than enough time for Jalen Hurts to lead an Alabama comeback—and he did. Alabama needed a fourth down conversion to keep the drive moving. A trick play that saw ArDarius Stewart complete a 24-yard pass to last year’s championship game hero, O.J. Howard, got Alabama within striking distance at the Clemson 30-yard line. On the next play, Hurts broke the hearts of Clemson fans everywhere when he retook the lead for Alabama with a 30-yard touchdown run. But he made one mistake. He left over two minutes (2:07) on the clock; more than enough time for Deshaun Watson to work his magic. C.J. Fuller gave the Tigers good field positon with a return out to the Clemson 32-yard line. A short completion to Jordan Leggett, a longer one to Mike Williams, and a trick play to Wayne Gallman got the Tigers to the Alabama 33-yard line with 1:41 to play. A short run by Watson, a short completion to Hunter Renfrow, and a longer one to Leggett saw Clemson reach the Alabama nine-yard line with 19 seconds to play. The sadness Hurts caused with his touchdown run had turned into nervous energy as Clemson fans saw their team get into position to at least send the game into overtime. But a win would be so much nicer, and with 14 seconds to play after Watson spiked the ball Clemson would have a couple shots to win. The first resulted in a pass interference call in the end zone that moved the ball up to the two-yard line. With nine seconds on the clock, Watson connected with Renfrow on a two-yard touchdown that will go down in Clemson history. But the game wasn’t over yet. After the extra point attempt put Clemson up 35-31, there was still one second left meaning Clemson would have to kick the ball back to Alabama. But rather than give the Crimson Tide a shot at a miracle comeback, the Tigers called an onside kick. Alabama wasn’t ready for it, and the ball was easily recovered by the kicker. 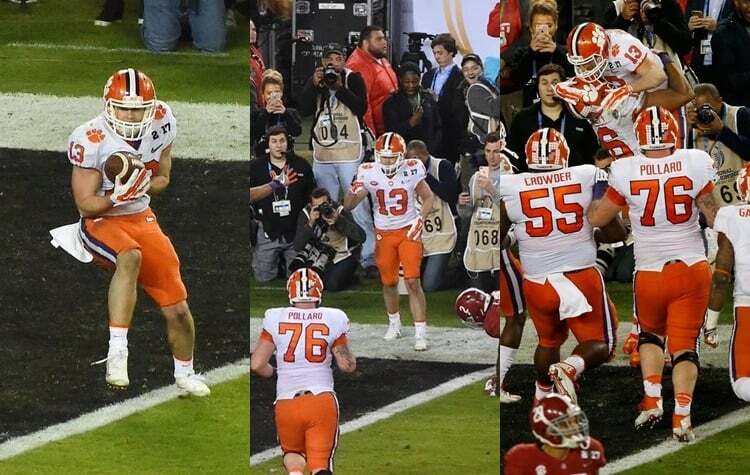 One kneel down later it was official—Clemson was the new national champion! The Crimson Tide had control of the game early on. After stuffing Clemson on a fourth and one in the first quarter, it only took the Alabama offense three plays to score. It didn’t look good for the Tigers as Bo Scarbrough ran through the Clemson defense and even dragged a defender into the end zone for the first touchdown of the game. He scored his second of the game early in the second quarter with a 37-yard run that put Alabama up 14-0. Watson would get Clemson on the board with an eight-yard run a couple of drives later making the score 14-7 at the half. 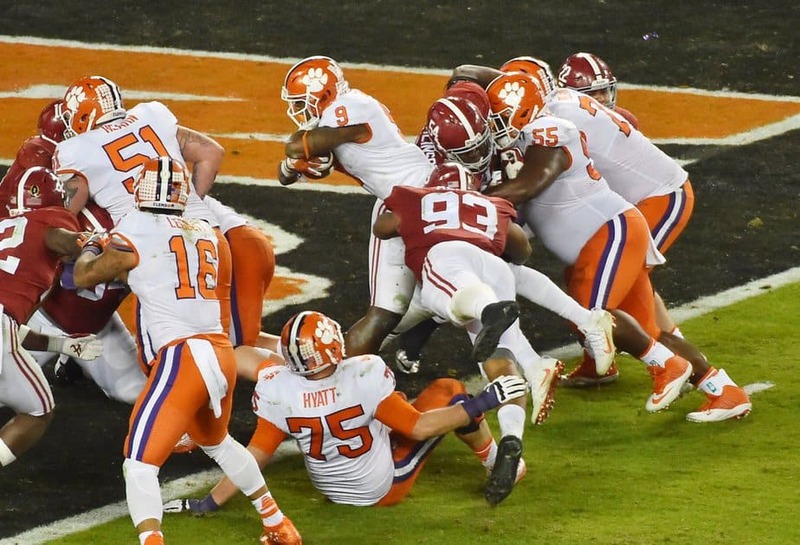 To win, Clemson knew it needed to force Alabama to throw—which they did in the second half. As expected, Hurts struggled (13-31 for 131 yards and a touchdown), but he did complete a beautiful 68-yard touchdown pass to O.J. Howard that put Alabama up 24-14 late in the third quarter. But the Alabama defense grew tired as the second half went on after being on the field for too much of it. Clemson scored 21 points in the fourth quarter on touchdown drives of 72, 88, and 68 yards with most of it coming through the air. Watson ended the game with 420 yards and three touchdowns after completing 36 of 56 pass attempts. Four players had 90+ receiving yards with Hunter Renfrow leading the way with 10 receptions for 92 yards and a pair of touchdowns. Mike Williams, who was out of last year’s title game recovering from a neck injury, was clutch with eight receptions for 94 yards and a touchdown.